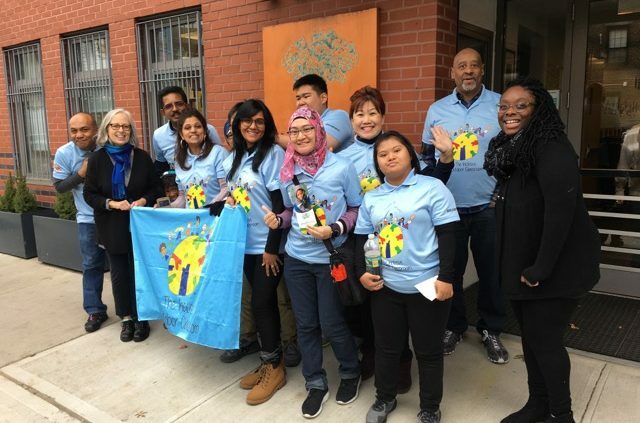 It was a pleasure to host a visit from the teachers and some of the students from The Inclusive Outdoor Classroom, a program based in Malaysia. 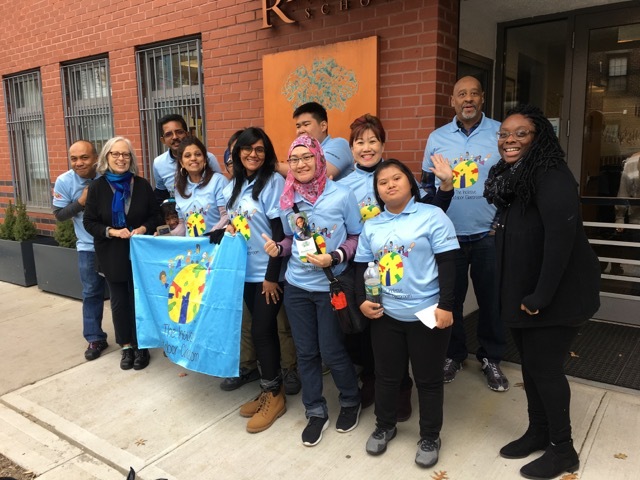 Our colleagues at the Maple Street School organized the visit to Rivendell and the group was accompanied by Maple Street Assistant Director Peggy Francois. We enjoyed a lively tour with lots of opportunities to share thoughts about our Montessori philosophy and shared mission of inclusion and answer questions about Rivendell Preschool as well as our CORE, evaluation and special education itinerant teaching programs. Here’s a photo of our visitors with Peggy Francois and Rivendell’s Director, Katy Hill. This article originally appeared in the Brooklyn Paper on June 15, 2018. 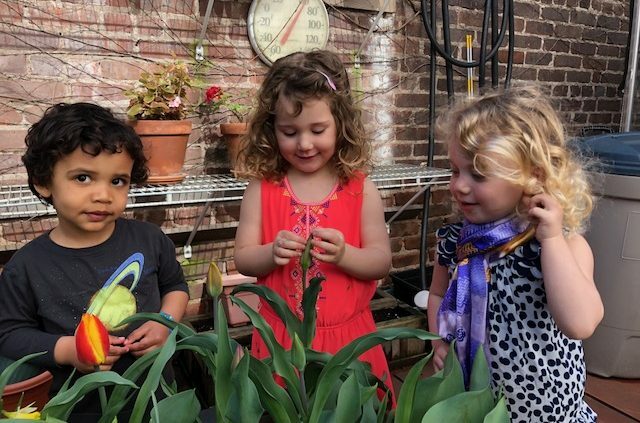 It sometimes seems that Rivendell School, for children ages 2–5, is the best-kept secret in the Gowanus area. The beautiful, modern building is an inviting environment, surrounded by restaurants, coffee shops, and gardens. The school has its own garden, too, tended by the children. 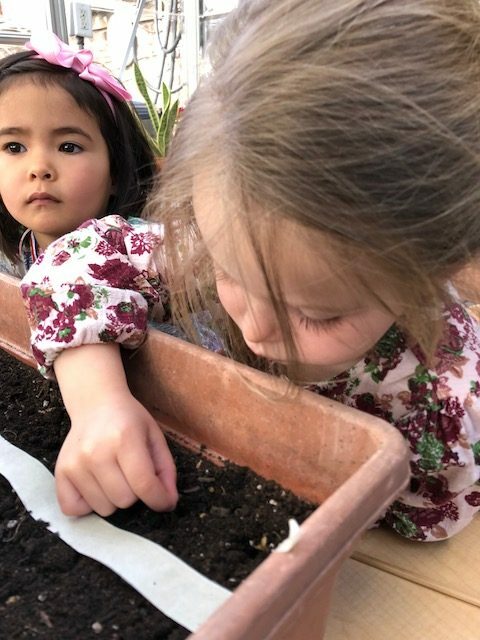 It’s all part of Growing Connections, the hands-on program that allows the children to experience planting and harvesting. 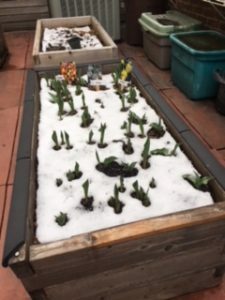 They get to feel dry and wet soil. They water plants. Then, they share the fruit, vegetables, and herbs that they have grown, taking pride in seeing it all from start to finish. 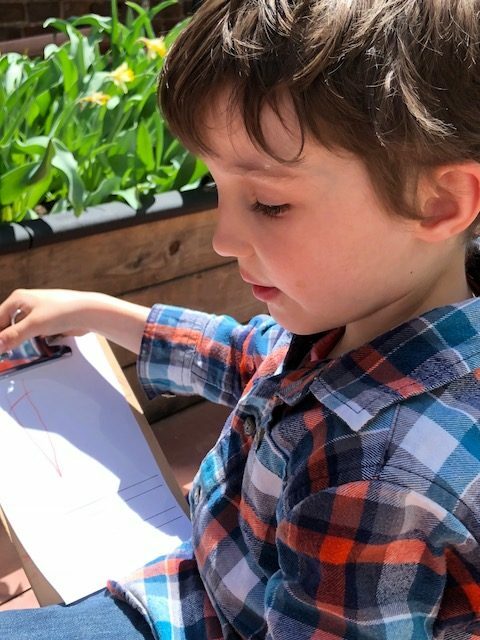 At the same time, they learn valuable and age-appropriate science lessons about composting, the life cycle of seeds, and how the changing seasons impact gardening. They see for themselves that soil, water, and sun are essential to growth. Every day is Earth Day at Rivendell, where the children collect food scraps from lunch to share with composting worms. They separate their trash into the correct recycling bins, learning at a young age to become responsible world citizens who respect the earth. 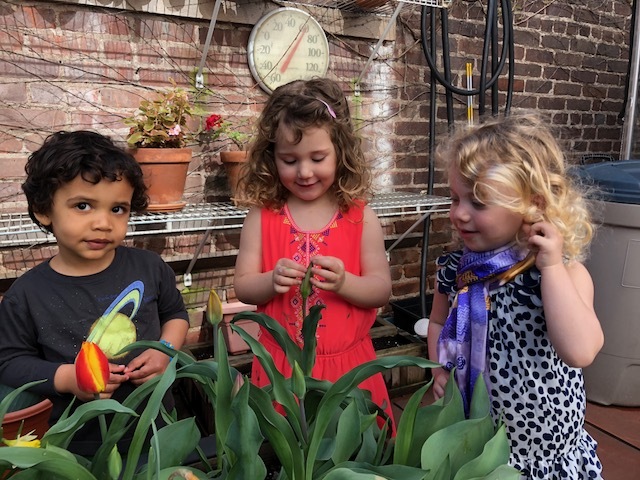 This positive environment is in keeping with the philosophy of Maria Montessori, who believed that a more peaceful world begins by nurturing each child’s spirit with kindness, compassion, and love of learning. Such activities also encompass the school’s philosophy that emphasizes the power of team-building activities. 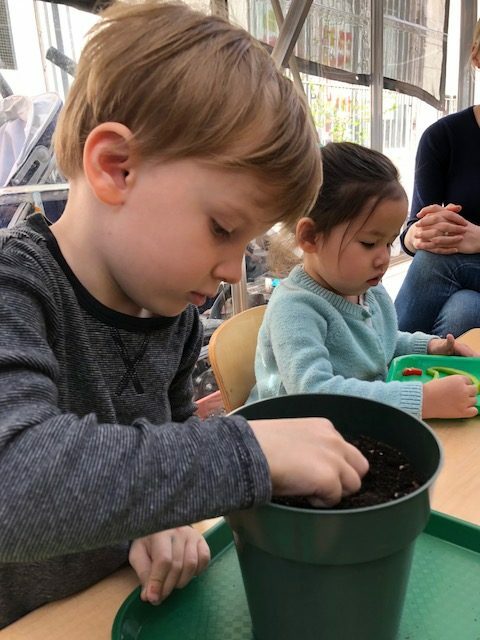 Children from all backgrounds, and with a variety of learning styles, are welcome, as the school’s philosophy stresses the importance of learning to get along with everyone. Accepting and respecting differences among people has lasting benefits for everyone. Rivendell offers inclusive programs that promote excellence in early childhood education. Emphasis is placed on learning designed for different levels of readiness, and the school is committed to providing support to the families that it serves. There is a generous child-to-teacher ratio in every classroom at Rivendell as well as extra support for students who need it. As a result, the school is a place where children thrive and learn together. The history of Rivendell dates back to 1977 when the pre-school opened in a Park Slope brownstone called The Children’s House of Park Slope. In 1998, it was incorporated into Rivendell School, which was founded in 1995. 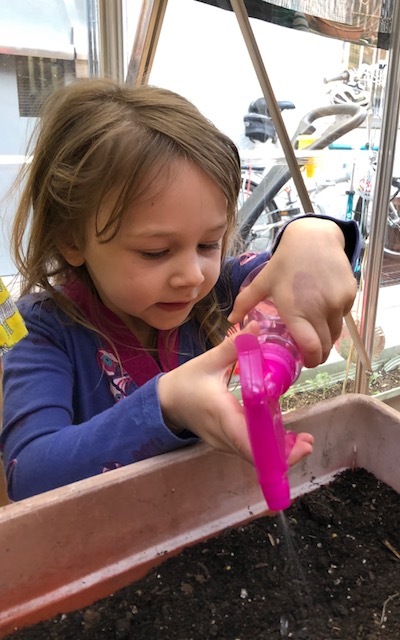 Early on, the children learn what it takes for a plant to grow happily; they feel the dry and wet soil and spray the plants with water if needed. They study the elements that are necessary for a seed to grow (soil, water and sun for warmth). Later on, the children transplant seedlings, so the roots have more space and the plants can grow bigger and happier. The children in the bigger classrooms have learned about recycling, they separate the trash from their lunches and place it into the correct recycling bins every day! All the Rivendell students enjoy collecting food scraps from their snacks and lunches and share it with our composting worms, instead of throwing it in the trash. Great job keeping our planet beautiful and healthy! Rivendell Director Katy Hill, CORE Program Coordinator Rosalie Woodside and special education itinerant teacher Denise Taddonio will present their poster From Peer Coach to Classroom Partner: Lessons Learned in Including Children with Autism in Preschool this December at the Zero to Three Annual Conference in San Diego, California. The poster documents the development of increasingly collaborative efforts among special education and classroom teachers as they work together to define their roles and share responsibility in the inclusive classroom.